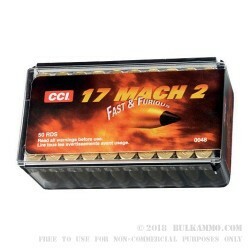 Exceptional speed and accuracy characterize the .17HM2 round from CCI that utilizes the polymer tipped 17 grain Hornady projectile to great effect. This is a very impressive round that features a necked down .22 LR that provides a screaming fast projectile and great reliability. An important note: this is not the .17 HMR round. This is a .17 HM2 round. It is a substantially different round. The .17HMR utilizes a necked down .22 WMR casing; the HM2 (this offering) utilizes a necked down .22LR cartridge. From a safety perspective and a functional perspective, the rounds are not at all interchangeable or compatible. DO NOT fire this in any firearm other than that listed for the caliber of the cartridge: the .17 HM2. This is not a dual-purpose round, it is somewhat narrow in its intended use case: small animals that do not need drastic penetration but for which, a moderate range up to 175 yards or so is suitable, and for which a .17 caliber bullet may be used to good effect. It is an impressive performer in that segment of the market. This is not meant for shooting in high winds, necessarily or on larger animals, but for what it’s intended for, there may not be a more fun round available. Q: Is this ammo .17HM2 the same as .17HMR. In other words will it fire from a rifle chambered in .17HMR?? A: The .17 HMR and HM2 are different cartridges and will not be interchangeable with each other. While it is known for the .22 , 22 long and 22 LR to accept shorter rounds than the chamber, this will not be the case with .17 ammo due to the design of the brass.